What do you think of life at Westerburg High during the first season of the Heathers TV show on Paramount Network? 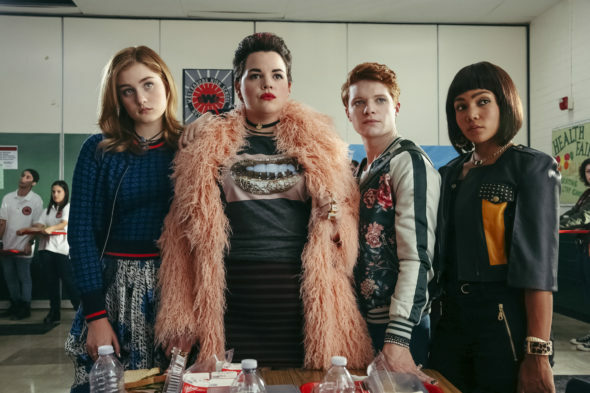 As we all know, the Nielsen ratings typically play a big role in determining whether a TV show like Heathers is cancelled or renewed for season two. Unfortunately, most of us do not live in Nielsen households. Because many viewers feel frustration when their viewing habits and opinions aren’t considered, we’d like to offer you the chance to rate all of the Heathers season one episodes here. A Paramount Network black comedy anthology series, Heathers stars Grace Victoria Cox, James Scully, Melanie Field, Brendan Scannell, Jasmine Mathews, Drew Droege, Jesse Leigh, Romel De Silva, Deanna Cheng, Adwin Brown, Cameron Gellman, and Brett Cooper. Guest stars in the first season include Shannen Doherty, Selma Blair, and Casey Wilson. Based on the 1988 film starting Winona Ryder and Christian Slater, the story centers on Veronica Sawyer (Cox), the “Heathers” who rule the popular clique at Westerburg High School (Field, Scannell, and Matthews), and Veronica’s boyfriend, JD Dean (Scully). JD gives a whole new meaning to having a dark side and makes it clear no one is safe from his appetite for destruction, including Veronica.